In the men’s competition, Olympic champions Argentina overturned a two goal deficit to record a 3-2 victory over Spain in dramatic fashion. Goals from Matias Paredes, Lucas Toscani and a penalty stroke from Maico Casella completed a comeback which has moved Los Leones into the top four of the standings. The opening two quarters of the Argentina (FIH World Ranking: 4) versus China (WR:10) women’s match were far closer than home fans would have liked, with the Asian giants frustrating Las Leonas in first 30 minutes. The hosts created the better of the scoring opportunities but could not find a route past Ye Jiao, a goalkeeper who has impressed throughout the inaugural edition of the FIH Pro League. Argentina, who continue to miss talismanic attacker Delfina Merino through injury, scored what proved to be the winning goal in the third quarter, and it was a strike worthy of winning any match. Silvina d’Elia saw her initial penalty corner flick blocked before producing a moment of inspired brilliance, touching a high ball into space and cracking a backhand half-volley into the bottom right corner to break the deadlock. Agustina Albertarrio wasted an excellent opportunity to double the advantage late on, but it mattered little as the defensively outstanding Argentina comfortably claimed another three points. Remarkably, it is now 266 minutes since Argentina last conceded in the FIH Pro League, having recorded four successive clean-sheet wins since a 34th minute strike from Dutch ace Pien Sanders saw Las Leonas lose 2-1 against the Netherlands in Buenos Aires on 24 February. It would prove to be a day of double celebration for Argentina’s home fans, although it certainly did not feel like it for the first three quarters of the men’s match between Los Leones (WR:4) and the Red Sticks of Spain (WR:9). The Spaniards were by far the better team in the first half, deservedly opening up a 2-0 lead thanks to a fortunate strike from Enrique Gonzalez that deflected into the goal via the stick of Argentina defender Ignacio Ortiz before Juan Catan dived at full stretch to touch home a blistering cross from Pau Quemada. Quemada had two glorious chances to further extend the advantage in the third period, with Gonzalez also missing before Argentina veteran Paredes scored two seconds before the end of the quarter to give his team a life-line. Lucas Toscani crashed a sensational volley into the roof of the Spanish net to level the scores at 2-2, with the winner coming from Maico Casella’s perfectly executed penalty stroke after a Player of the Match Paredes was fouled with the goal at his mercy. The third and final match of the day took place at the Spooky Nook Sports Complex in Lancaster, Pennsylvania, where USA (WR:12) hosted Olympic champions Great Britain (WR:2). The home favourites made the first impression on the scoreboard midway through the second quarter, with Mackenzie Allessie adding the finishing touch to a well rehearsed penalty corner routine. USA’s lead lasted just five minutes, with Lily Owsley producing a cool body swerve to move past American shot-stopper Kelsey Bing to restore parity at half time. Owsley made two significant contributions in the third period, providing the assist for Emily Defroand to pounce from close range before getting a crucial touch on a penalty corner routine as Great Britain established a 3-1 lead that proved to be enough for all the points. It was Great Britain’s first win of the FIH Pro League, and will give the team great confidence ahead of their upcoming meeting with Argentina in Rosario. 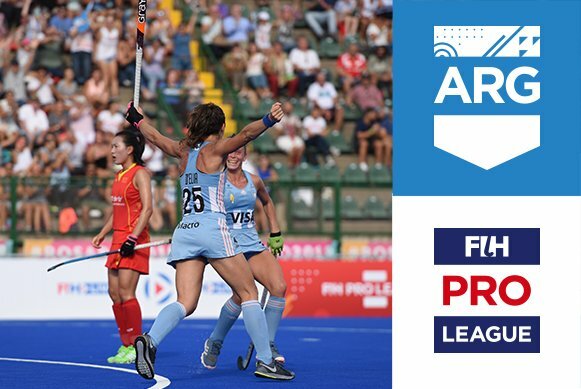 The FIH Pro League continues next weekend with Rosario’s Estadio Mundialista hosting the men’s and women’s fixtures between Argentina and Great Britain on Saturday (6 April), while Belgium’s women take on China on Sunday (7 April) in Brussels.